Winner of the Best Screenplay (by Simon Barrett), Best Actor (AJ Bowen) and Best Actress (Amy Seimetz) at the 2010 Fantastic Fest in Austin, Texas, A Horrible Way To Die (2010) was Adam Wingard's third feature, after a promising debut Home Sick (2007) and Pop Skull (also 2007). Sarah (played by Amy Seimetz) is trying to start a new life thanks to the help of Alcoholics Anonymous and Kevin, her new boyfriend (played by Joe Swanberg). Her old existence fell apart when she realised the man she loved was a psychopath after accidentally finding his 'Kill Room'. But now Garrick Turrell (AJ Bowen) has escaped from prison and the corpses start piling up as he travels a direct line from Sarah's old life to her new one. As with Home Sick and Pop Skull, A Horrible Way to Die has devided audiences and critics a little, but does pave the way for Wingard's most recent film, You're Next, a fresh and energetic take on the home invasion sub-genre that was a hit at the 2011 Toronto Film Festival and is attractive some very positive reviews. 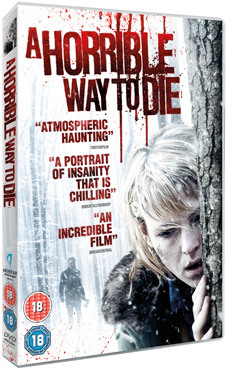 A Horrible Way to Die will be released on UK DVD and Blu-ray on 19th March 2012 by Anchor Bay Entertainment at the RRP of £15.99 for the DVD and £19.99 for the Blu-ray. No Extra features have been listed as yet.